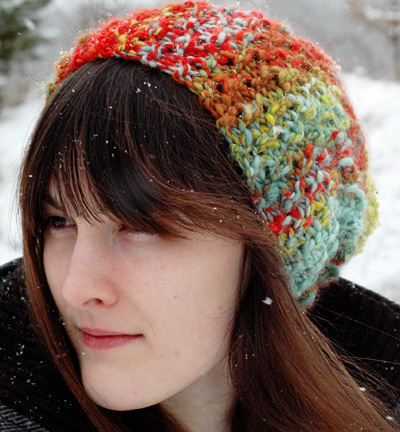 The brim is knit horizontally in a simple, easily-memorized textured stitch and the crown is picked up along the edge and quickly decreased for a flat-topped, slightly slouchy hat. Top with a sizable coordinating pom-pom for maximum impact. *It has nothing really to do with the Mandelbrot set, though. Unless, of course, you make matching mittens and a scarf. Badumching! Some sort of hodge-podge self-taught medium-draw, worsted. Larger than inchworm, smaller than long draw. The fiber was prepped for fractal spinning, which is described in more detail in this article. Pattern row: [K2, p2] 3 times, k2. Repeat Pattern row until piece measures 14.5[16, 17.5] inches unstretched (should stretch comfortably to 20[22, 24] inches – if not, continue until it does). Work 2 more rows in pattern. Seam the cast on and bound off edges together. 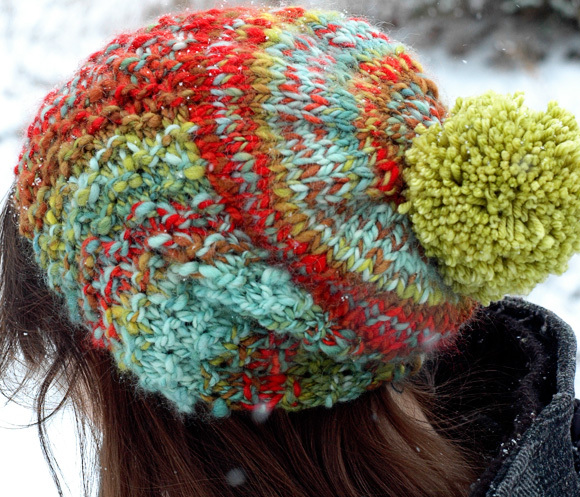 With RS facing, and using 16-inch circular needle, pick up and knit 54[60, 66] stitches around one side of the brim. Distribute sts as you prefer and join for working in the round. Place a marker for the start of round. Note: As you work the crown decreases, switch to DPNs, magic loop or two circulars as circumference gets too small to work comfortably on 16 inch needle. Crown round 1: [K4, k2tog] around. 45[50, 55] sts. Crown rounds 2, 4, 6, 8: Knit around. Crown round 3: [K3, k2tog] around. 36[40, 44] sts. Crown round 5: [K2, k2tog] around. 27[30, 33] sts. Crown round 7: [K1, k2tog] around. 18[20,22] sts. Crown round 9: [K2tog] around. 9[10, 11] sts. Cut yarn leaving a 6-inch tail and draw through remaining stitches, pull to close. Weave in ends. Block very gently. 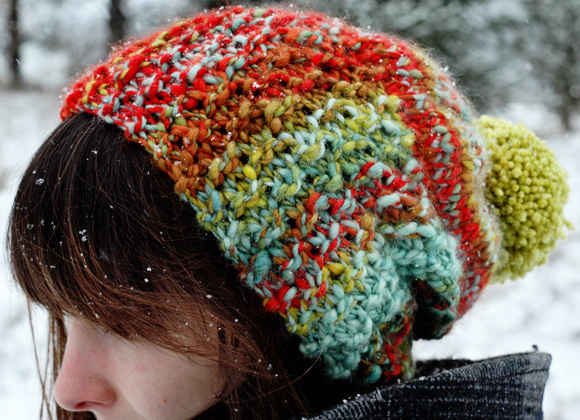 If desired, make a pompom and sew to crown of hat. Alex knits, crochets, spins, and otherwise screws around and ignores her wasted psychology degree over at dull-roar.com. She enjoys cookies and dog-wrangling, but not so much bio-writing.